The house is on top of a hill in the middle of a big garden (13,000 square meters) overlooking a valley with a wonderful landscape and view on the lake and, when it is clear, even of the sea! You will be the only guests with the gardens and pool at your exclusive disposal. The house is 2.5 km from the village, the road could be better maintained by the City management but normal cars driving slowly have no problem. Our house then has a short private road driving you up to your direct entrance through the garden. Ideal as a romantic gateway for nature lovers, the space you rent is the whole ground floor of about 130 m2 with a beautiful living room (with dining table, fireplace, library, chaise longue and 2 sofas), two independent bedrooms one with direct access to the garden, one bathroom near the bedrooms with cabin shower, bidet & washing machine, a fully-equipped kitchen, veranda, then two porches both with table and chairs, two tufo terraces and a pergola. In the Summer (Mid June - Mid September) with special agreement you can use also a semidetached space which is used for larger families or groups as 3rd bedroom with its own small bathroom and shower. The garden is quite special with its Mediterranean flora and its beautiful spaces offer plenty of privacy and you can actually 'wandern' within the park. There are at least 7 different places where you can rest in total privacy with many tables, chairs, and also beds on the terrace in front of the house and on the wood terrace at the pool. All is at your complete and exclusive disposal where you can choose to eat, rest, read, write, etc. No other guests in the property. A part from the garden our guests appreciate the comfort of the house, especially the 'best equipped kitchen', the beds, our International library, the elegant furniture both inside and outdoor (no plastic! ), the cozy best Jotul Norvegian fireplace, the laundry washed and ironed, and every year we keep investing in something new: guests who come back are always pleasantly surprised with a novelty! The location of the swimming pool with wood terrace, is particularly appreciated in the middle of the garden with a stunning view, of only sky, green and lake. Usually there is a wonderful breeze and even when in Rome the heat is unbearable here is very pleasant, but just in case we acquired a moveable air conditioning for exceptionally hot days. Our garden furniture is all of first quality, no plastic, we have a new outdoor table tennis and ecologically speaking, a 4 kwh solar system on the roof, we built two new tufo terraces in front and next to the house. The bathroom is remodelled with a glass cabin shower and new lavabo and furniture and we installed lights to enjoy the garden also at night.we recently enlarged some terraces in the garden and acquired new wood furniture for the pool. We still have to update the photographs. There are two entrances to the nearby natural park (no cars) a few minutes from the house. Check in : usually between 16:00 and sunset , different times are possible but have to be agreed. Check out if possible around 9.00, but you can stay longer as long as we can start preparing the house for the next guests. We will be there to welcome you and introduce you to the house and the area and on and off for maintenance. For emergency you can always reach us on our cell phones. If we are there our entrance is detached from yours and on another level and we have a small atelier and garden on the back that you do not see. The whole garden is made of dozens of terraces and each step you have a surprise with a different perspective. There are villages all around, but the nearest one is Bassano Romano, with all shops, 2 supermarkets open also on Sunday, market on Wednesdays and pizzerias and local restaurants only 2,7 kilometers away. You can find a larger choice at Trevignano or Sutri or Ronciglione (also Bio store) which are nearby. Ideal for one couple or two friends who wish to feel merged in nature but also for families with children or different compositions up to 4 adults. It may exceptionally sleep up to six( or more with the extra semidetached). The weekly price is for occupancy for 2 adults in the main house. In the Summer months (from June till September) you can refresh and swim in the new private outdoor pool with wood terrace. We also have a regular bocce field under a wonderful oak tree and a 'tufo' stone amphitheatre that is sometimes used for open air performances or exhibitions, but not when we have guests staying in the property, of course! Also ping pong and badminton net. The location is highly strategic for all kind of tourism and for longer vacations (we had many guests for 4 or 6 weeks) but also as an ideal one week rest if you are traveling around Italy by car. Near Trevignano and the Lake of Bracciano in the middle of beautiful nature, with history, culture, and art at easy reach. Rome is less than one hour away as well as the Mediterranean Sea, but much nearer are the many lakes and the thermal springs and the beautiful Etruscan sites, the Medieval and Renaissance villages and Palazzos all around. One of the best golf course of the area of Rome is just 10 min. away and the Lakes of Bracciano, Martignano, and Vico are real jewels, as well as Lake Bolsena a little more north. to Pisa: 300 km, to Pompei/Naples: 290km. Nearest train Station 12 km: Oriolo Romano or Capranica/Sutri (train arriving to Rome San Pietro- Trastevere and Ostiense). Nearest bus stop 3 km (bus arriving in connection to Metro train to Piazza del Popolo). To visit Rome as an alternative to the train or bus we suggest to drive ( not during rush hours) in about 30 min. to Saxa Rubra - Free Parking near Rome and then take the metro train, a 10 min. ride takes you right to the centre, 5 min. from the Spanish Steps. Many guests made it in less than one hour with the right connection. Ideal place next to Rome, Tuscany, and Umbria. We would help you to plan your excursions with a complete list with distances and suggestions, but we warn you: you might just enjoy the peace and the beauty of the place! Shorter stays are possible only to fill in holes and price has to be defined according to the season and number of guests. You should have a car in order to move around, if you are happy just with walks and a few excursions then we could meet you at the nearest train stations of Capranica-Sutri or Bracciano and drive you home. We have had guests who have just enjoyed the garden and walking distance surroundings for one week! The last three kilometers of country road from Bassano along the little rough (because of lousy local management) Strada Comunale per Trevignano, drive you away from everything and you are in the middle of real nature in your own park. We have beautiful and quiet cats outside in the property so usually no dogs (but we make exceptions) and people strongly allergic to cats should not go near them. If you don't call them they stay away. The cats are not allowed to go anywhere inside and guests who love cats should play with them outside. We often have had allergic people and they had no problem. In Winter we provide free wood for the Jotul fireplace stove with glass and ventilator which can warm up the whole space. If you use also the central heating you pay gas according to consume (but we offer a free allowance for hot water and cooking). We offer very special Winter discounts on request depending on dates and lenght of your stay. We, my husband Hans-Hermann (German, artist and biologist) and myself, Elisa (Italian, art and garden curator) are multilingual and multicultural and we love sharing the enchantment of this place with our guests. We are professionally involved in the arts - visual, audiovisual and nature , and we consider our garden a form of work of art. We are very proud of our new solar system on the main roof, a sign of our ecological engagement and of the sustainable management of our garden, listed as Il giardino di Pianamola among 'The most beautiful parks ' of Italy. At first sight we fell in love with the stunning view and the landscape, and we think we had an incredible luck finding a piece of natural paradise from where you can reach Rome and two International airports in less than one hour. The main bathroom has a spacious glass cabin shower , bidet, , large basin, WC and many places to hang your towels. Also a brand new washing machine with rapid program. In the village, besides shops, you can visit Palace Giustiniani where the famous film La Dolce VIta was shot by Fellini, and in the Monastery San Vincenzo there is a statue by Michelangelo! no covered garage but park area next to the house inside the property. Both in house and also special colored towels for the pool. International library: arts, nature and novels in many languages. 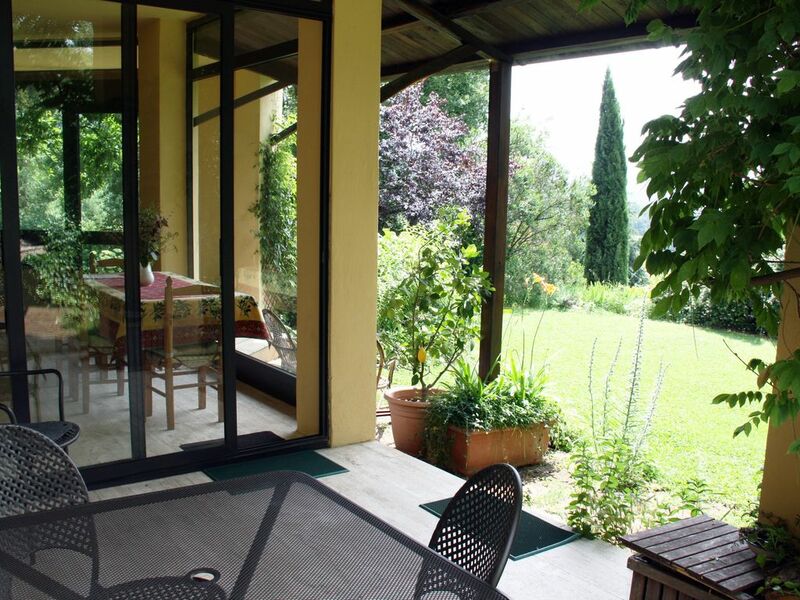 Hans-Hermann and Elisa have put years of hard work into making their large, completely private land in the hills above Lake Bracciano a paradise. It's location makes it ideal for anyone wanting to be able to enjoy Rome during the day and escape to a peace and solitude at night. (Or, for that matter, to explore rural Lazio and southern Umbria and Tuscany.) The house is spotless and equipped with everything that's needed. Nearby stores are very well stocked. The kitchen is on the small side but quite serviceable for preparing multi-course dinners for four from scratch. The owners are ready to provide anything from items you forgot to pack to suggestions on local sights. Both are fixtures in the local (and well beyond) art scenes, and the decorating of the home and installations in the gardens reflect this. Those gardens are beautiful, as is the swimming pool and its site. We couldn't have been more pleased with the accuracy of the VRBO descriptions, the quality of the accommodations and the hospitality of the owners. When guests write such a deep appreciation of our place we are really touched and it is the best reward for our efforts. Thank you so much for your personal and warm perception of the landscape and the location. You were wonderful guests, open to explore and exploit the potentiality of our place, we hope to have you back soon, maybe in Spring or Summer! Pianamola is a wonderful retreat. Words cannot do the amazing garden justice - so many places to sit and relax and just take in the beautiful views. We brought the summer with us so the pool was well used, as were the many shady spots to get out of the sun. The accommodation has everything you could need and Elisa and Hans Hermann are the most lovely hosts - nothing is too much trouble and they go out of their way to ensure their guests have a great holiday. There are lots of lovely places to visit within a short drive - although the local roads (even fairly major ones) are narrow and have lots of large holes which doesn't seem to effect the local drivers, but English drivers in hire cars may want to consider the all-inclusive insurance to keep the stress down!! We have had a fantastic holiday - thank you Elisa and Hans Hermann for sharing your beautiful home. Thank you for your appreciation! and you are right, roads are indeed a little adventorous in Italy, but that's the peculiarity that makes them so fascinating! One has to drive slowly and I believe you did not have any accident or mechanical inconveneince...and once you reach up hill the view makes up for the effort! My husband & I stayed here for a week in early January 2016. We needed a place to "recharge our batteries" after a very busy Christmas/New Year period with our large Italian family. Pianamola was definitely the right place. The beauty and peace of this area has to be experienced. Although it was cold outside, we were kept snug and warm inside with the wood-burning stove. There are many walks in the surrounding countryside and Rome is easily accessed by train if you need the hustle and bustle. Elisa & Hans-Hermann's garden is an amazing creation - a work of art. This place was perfect for us at that stage in our journey and we thank Elisa & Hans-Hermann for their endless kindness. Wonderful guests who have captured the beauty and the uniqueness of the location and its surroundings! Thank you! We are looking forward to welcoming you soon again next time you are in Europe. Zeer mooie plek om lekker te relaxen nadat we een week Rome hadden bezocht: geweldige tuin met een imposant uitzicht op het meer, fijn huis met prima voorzieningen ( een beste keuken! ). Elisa en Hans zijn de ideale gastvrouw en gastheer: geven je info over de omgeving en hun tuin met groente en kruiden die je lekker vers kan plukken. Mooie herinneringen houden we over aan ons verblijf in pianamola. My family had a wonderful time this summer at Pianamola. The house and the amazing garden around it, was a true treasure. Elisa and Hans give us a warm welcome and helped us to get around. We made day trips to places near by and, of course, visited Rome. I absolutely want to come back some day and enjoy the peaceful country life in the middle of the italian sun again. My children said that this was the best holiday ever! We are so happy to have Finnish guests who appreciate so much our garden, house and location. They were all simply marvellous and we wish to welcome them soon again. Es waren wunderbare entspannende Tage bei Hans und Elisa, wir hatten allen Komfort und dennoch unsere Abgeschiedenheit und Ruhe, die wir brauchten! Vielen Dank dafür! Die Bilder von der Natur und von oben auf den See sind noch in unseren Köpfen und erleichtern den Alltag in Deutschland! Thank you for recognising a long lasting effect for your just over 2 weeks holiday in our paradise! Es ist schoen zu hoeren, dass sich unsere Gaeste lange an unser Haus und Garten erinnern und die Erhohlung mit in den Alltag nehmen. Inside the property you have: parking, bocce field, table tennis, badminton net, several gardens with different vegetation and views...and a tufo stone amphitheater under a majestic oak tree. Nearby wonderful excursions within an hour drive, both cultural and natural, walks and trekking on foot or professional mountain biking. Hard to name places to see as there are hundreds. We can send you a list. Rates are subject to change according to season and special dates and depending on length of stay and on number and age of guests. Extra fee per stay of 60 euros for cleaning and linens for 2 people, any extra person 10 euros each extra bed. Children up to 2 yrs old are free, if 3-to 12 add 10 euros per night, 12 to 16, 15 euros. We provide free wood for the Jotul stove-fireplace, but for central heating if needed the payment is according to consume.